The 43rd Annual Golden Tree takes place December 4 – 6. Come kick off the holiday season with three days packed with premier shopping, distinctive food, and festive entertainment. 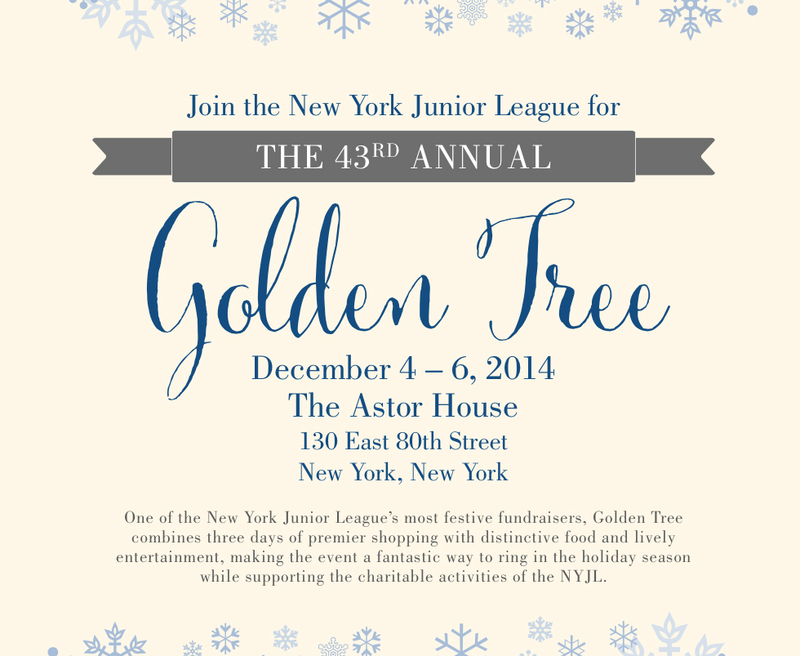 Golden Tree is a fantastic way to ring in the holidays and get a head start on your holiday shopping while supporting the charitable activities of the NYJL. During the event, the Astor House transforms into a veritable one-stop holiday shopping destination, with a large variety of vendors offering goods including clothing, apparel, accessories, kitchenware, linens, and gifts for the home. • On Thursday and Friday afternoon, a special holiday luncheon and tea service will be served in the Roosevelt Room. • Join us Thursday evening for the Silver Bell Soiree as we celebrate the NYJL’s dedicated volunteers with milestone membership years as well as past Golden Tree Co-Chairs with a Tinsel Toast led by NYJL President Stacey Lawrence Lee. The evening will include a holiday music performance, snacks, and sips. • On Friday evening, join us as we turn up the holiday cheer for the Holly Jolly Young Professionals’ Night featuring light bites from 83 ½ restaurant and chocolates from Air Berlin. Come to shop, and stay to enjoy an evening of fun! • Your little elves are invited to a festive breakfast from Bistango and photo session with Santa on Saturday morning. The Junior Junior League committee will lead holiday-themed activities throughout the morning. • Those looking for some pampering can revive and restore with Saturday afternoon activities to complement holiday shopping. Indulge in mini spa therapies from exhale, IOMA, and more while enjoying light bites and bubbly with friends. The Festival of Wreaths will decorate the walls of the Astor House both Thursday and Friday, featuring designer wreaths as well as wreaths decorated by community spotlight committees. All wreaths will be available for purchase through silent auction. Purchase your Golden Pass giving you access to all shopping sessions and events as well as a VIP gift bag featuring goodies from Manhattan Magazine, Ralph Lauren, Estée Lauder, Bleulili Home, and more. Purchase tickets in advance and receive a full list of vendors online. Tickets will also be available at the door.